It took me too long to finish Prey. When I started in 2017, I was too scared to continue after only playing six to seven hours. The enemies were lumps of black matter; they were frightening in their strangeness. They hissed at me and made weird sounds, and all I had against them at first was a wrench and a gun that shot cement. Although I was still drawn to the game, I couldn’t continue playing. I quit and sold the disc, as if leaving myself no chance of return. When I finished it two years later, in a sense it became an exercise in pushing through the fears, and more importantly, it was a chronicle of endings. 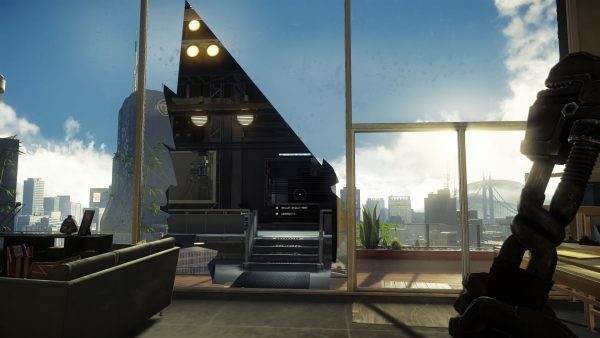 As many games do, Prey has multiple endings to the story, and even more of them unfold within the story itself. In Thierry de Duve’s essay, Art Was a Proper Name, he imagines the figure of an anthropologist from outer space descending to Earth to study humans’ art. The protagonist changes their role as they learn more about their subject. They start as the distant alien anthropologist, and then become an out of time art historian, then a theorist. Unable to proceed with the role they start from the beginning, returning now as a sociologist from Earth, then turn into historian of the avant-garde, and next into a semiologist. And when this role doesn’t fit anymore they transform into an amateur, into a critic. When I think about Prey, there are some similarities in how narrative threads get exhausted, and then others are introduced. In this manner, the game is like several layers of illusion stacked on top of each other, with their own particular exits. With each new iteration, the previous state expires, and the position of the player character transforms as well. 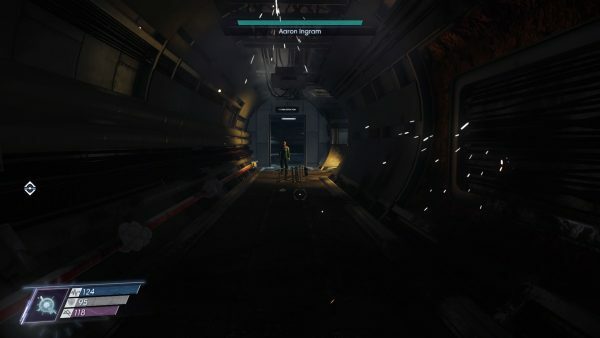 We play as Morgan Yu. Together with our brother, Alex, we run the TransStar testing center: Morgan is Vice President, and our first objective is to get to HQ, where our brother is already waiting for us. Soon we will learn that we aren’t even on Earth, and the apartment we inhabit is just a simulation recreated on the space station Talos I. This is our first ending. At this point, we have no memory of Morgan’s past. Crawling between abandoned workstations, hiding from the Typhon—alien creatures that spread around Talos I—we gradually learn about the facility we work for. 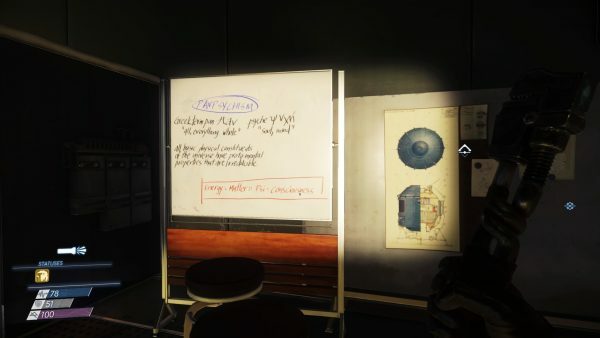 Prey suggests that in a universe where John F. Kennedy survived the assassination, the exploration of space is recast as an exploration of possibility: what if there is extraterrestrial life? What if we study it to our advantage? What if instead of fighting the unknown creatures, we make them allies? Talos I was deployed to study the Typhon in order to learn about their abilities, which obviously didn’t end well, as the Typhon broke out of containment and killed almost everybody on the station. So here we are, the surviving researcher, lost in space. We have the responsibility to preserve the knowledge while sacrificing the memory of ourselves. The most fascinating ability of the Typhon, which eventually Morgan can learn, is mimicking everyday objects. Everything poses a threat now. Everything is a potential alien. Here is where our knowledge about things is annihilated: our next ending. And this is where Prey embodies this double nature of being an alien thing. It makes us doubt every object, seeing the regular things completely de-familiarized, kind of in the way Ian Bogost described in his Alien Phenomenology, shifting the position of the imagined alien from the “darkness of outer cosmos” to the objects that surrounds us. 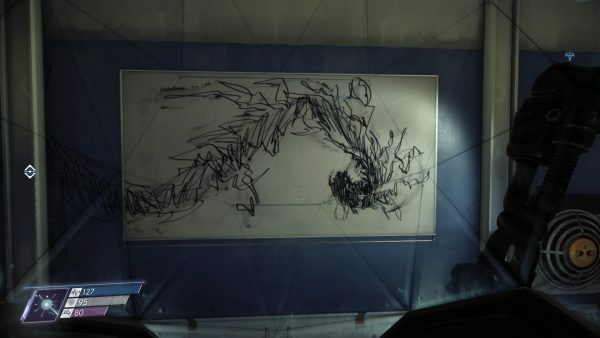 Prey also gives you a taste of what it is like to be a thing, giving Morgan the ability to mimic objects both to trick creatures out on the hunt and to squeeze through blocked passages. Now we are not just a human anymore, we are the asset, we are the pathfinder of alien subjectivity. De-familiarization of things is followed by alienation of processes. The laws applicable on Earth are altered in space. People who were convicted on Earth become “volunteers” in deadly experiments. Before they are exposed to the Typhon and faced their executions, their names are reduced to numbers, their identities to the things they had done and were charged for, with no chance of redemption and remembrance. This is the end of being; this is the end of personal memory. In space, laws on Earth cease to exist, and the parameters of our own knowledge push beyond the frontiers of our comprehension. Which in turn brings the exploitation of labor, and human and inhuman ethics as we know it is threatened, by the drive of colonization and augmentation. There are two basic options for finishing the game, as two voices pull Morgan in opposite directions. Starting with her memory wiped out, we gradually learn about what it is that she used to do here on Talos I, which helps us make an informed decision. One voice is composed out of Morgan’s own memories, urging her to destroy the station to prevent the destruction of Earth. The other one is the voice of Alex, who insists on one final attempt at conquering the alien species, thus saving the planet AND preserving the research, gathered with all those human sacrifices. At this point, we can either prevent further exploitation by destroying the station, and watch ourselves end, or we can push through to immortalize ourselves by saving the work we have done. And if we feel overwhelmed by the responsibility, we can just escape, leaving everything behind. Remember those videogame movies in late 90s, that repeated this idea of quitting the game as the only option of finishing it? 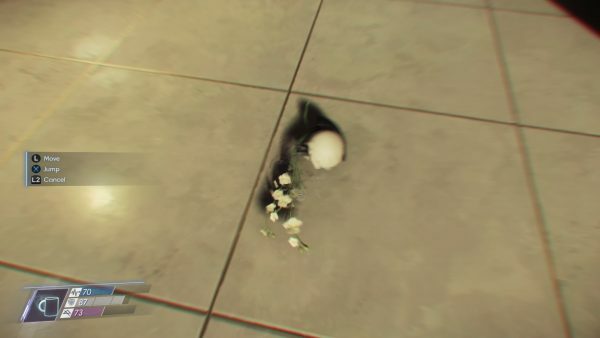 Prey has absorbed quitting in its own narrative. This is our other ending. There is no boss-fight in the game. Instead, there is this constant threat looming the whole time. Although they still bear some resemblance to recognizable creatures and sometimes humans, the Typhon, in all their types and species, are pretty abstract. And this abstraction is what makes them scary. As you proceed through the game, the species you encounter evolves, becoming tougher and bigger. Eventually, the whole station gets absorbed by the black, shapeless matter. At this point, the threat is no longer separate and distinguishable, but instead such dangers completely and utterly enveil you. This is the end of endings. Daria Kalugina lives in Moscow. Sometimes she works in artistic education, and dreams of building fictional worlds for learning.